VX Nerve Agent – What’s it all about? The incredible state sanctioned (unconfirmed but highly likely) execution of Kim Jong-nam has all the ingredients of a 1970’s John le Carré spy novel and the plot seems to thicken by the day as more and more details become available and the world is watching with bated breath to see where the story takes us next. According to reports today 28th Feb 2017 – the two women implicated in the killing of the estranged brother of North Korea’s leader will be charged with murder shortly, Malaysia’s prosecutor has says. Attorney General Mohamed Apandi Ali said the women – from Indonesia and Vietnam – would be formally charged and could face death if convicted. 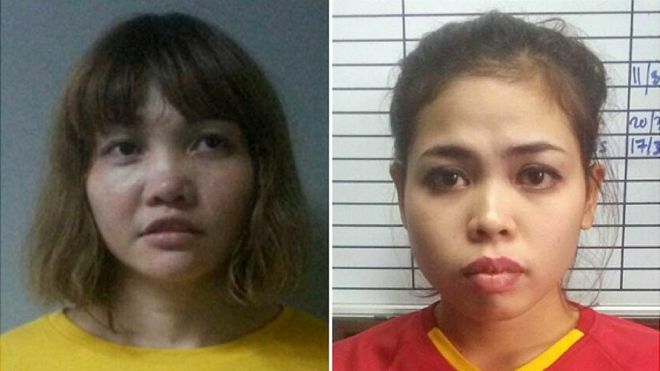 The women allegedly smeared a deadly chemical over Kim Jong-nam’s face at a Malaysia airport earlier this month. They have said they thought they were taking part in a TV prank. “They will be charged in court under Section 302 of the penal code,” the attorney general said, which is a murder charge with a mandatory death sentence if found guilty. He said no decision had yet been taken on whether to charge a North Korean man, Ri Jong Chol, who is also being held over the killing. That “depends on the outcome of the police investigation, which is still ongoing”, Mr Apandi was quoted as saying by AFP news agency. VX is a lethal nerve agent and one of the deadliest chemicals ever created by man. It is classified as a weapon on mass destruction by the UN and can come in liquid, gas or cream form. A victim can be subjected to as little as 10mg and be dead within 15 minutes. The chemical attacks the body’s nervous system and shuts it down, causing death. Victims may initially feel giddy or nauseous but soon their bodies begin to convulse and they can no longer breathe. VX (IUPAC name: O-ethyl S-[2-(diisopropylamino)ethyl] methylphosphonothioate) is an extremely toxic organophosphate. A tasteless and odorless liquid with an amber-like color, it severely disrupts the body’s nervous system and is used as a nerve agent in chemical warfare. Ten milligrams (0.00035 oz) is sufficient for it to be fatal through skin contact, and the median lethal dose for inhalation is estimated to be 30–50 mg·min/m3. As a chemical weapon, it is classified as a weapon of mass destruction (WMD) by the United Nations Resolution 687. The production and stockpiling of VX exceeding 100 grams (3.53 oz) per year was outlawed by the Chemical Weapons Convention of 1993. The only exception is for “research, medical or pharmaceutical purposes outside a single small-scale facility in aggregate quantities not exceeding 10 kg [22 lb] per year per facility”. The VX nerve agent is the best-known of the V-series of nerve agents and is considered an area denial weapon due to its physical properties. It is far more potent than sarin, another well-known nerve agent toxin, but works in a similar way. With its high viscosity and low volatility, VX has the texture and feel of motor oil. This makes it especially dangerous, as it has a high persistence in the environment. It is odorless and tasteless, and can be distributed as a liquid, either pure or as a mixture with a clay or talc in the form of thickened agent, or as an aerosol. VX is an acetylcholinesterase inhibitor, i.e., it works by blocking the function of the enzyme acetylcholinesterase. Normally, when a motor neuron is stimulated, it releases the neurotransmitter acetylcholine into the space between the neuron and an adjacent muscle cell. When this acetylcholine is taken up by the muscle cell, it stimulates muscle contraction. To avoid a state of constant muscle contraction, the acetylcholine is then broken down to non-reactive substances (acetic acid and choline) by the enzyme acetylcholinesterase. VX blocks the action of acetylcholinesterase, resulting in an accumulation of acetylcholine in the space between the neuron and muscle cell, leading to uncontrolled muscle contraction. This results in initial violent contractions, followed by sustained supercontraction restricted to the subjunctional endplate sarcoplasm and prolonged depolarizing neuromuscular blockade, the latter resulting in flaccid paralysis of all the muscles in the body. Sustained paralysis of the diaphragm muscle causes death by asphyxiation. VX is produced via the transester process. This entails a series of steps whereby phosphorus trichloride is methylated to produce methyl phosphonous dichloride. The resulting material is reacted with ethanol to form a diester. This is then transesterified with N,N-diisopropylaminoethanol to produce the mixed phosphonite. Finally, this immediate precursor is reacted with sulfur to form VX. VX can also be delivered in binary chemical weapons which mix in-flight to form the agent prior to release. Binary VX is referred to as VX2, and is created by mixing O-(2-diisopropylaminoethyl) O′-ethyl methylphosphonite (Agent QL) with elemental sulfur (Agent NE) as is done in the Bigeye aerial chemical bomb. It may also be produced by mixing with sulfur compounds, as with the liquid dimethyl polysulfide mixture (Agent NM) in the canceled XM736 8-inch projectile program. Like other organophosphorus nerve agents, VX may be destroyed by reaction with strong nucleophiles. The reaction of VX with concentrated aqueous sodium hydroxide results in competing cleavage of the P-O and P-S esters, with P-S cleavage dominating. This is problematic, however, as the product of P-O bond cleavage (named EA 2192) remains toxic. In contrast, reaction with the hydroperoxide anion (hydroperoxidolysis) leads to exclusive cleavage of the P-S bond. VX is the most toxic nerve agent ever synthesized for which activity has been independently confirmed. The median lethal dose (LD50) for humans is estimated to be about 10 mg (0.00035 oz) through skin contact and the LCt50 for inhalation is estimated to be 30–50 mg·min/m3. Nerve agents act by inhibiting the hydrolysis of acetylcholine (ACh) by acetylcholinesterase (AChE). Nerve agents bind to the active site of AChE, rendering it incapable of deactivating ACh. Any ACh that is not hydrolyzed (deactivated) still can interact with the receptor, resulting in persistent and uncontrolled stimulation of that receptor. Thus, the clinical effects of nerve agent poisoning are the result of this persistent stimulation and subsequent fatigue at the muscarinic and nicotinic ACh receptors. Early symptoms of percutaneous exposure (skin contact) may be local muscular twitching or sweating at the area of exposure followed by nausea or vomiting. Some of the early symptoms of a VX vapor exposure to nerve agent may be rhinorrhea (runny nose) and/or tightness in the chest with shortness of breath (bronchial constriction). Miosis (pinpointing of the pupils) may be an early sign of agent exposure but is not usually used as the only indicator of exposure. When treating VX exposure, primary consideration should be given to removal of the liquid agent from the skin, before removal of the individual to an uncontaminated area or atmosphere. After removal from the area, the casualty (the victim) should be decontaminated by washing the contaminated areas with household bleach and flushing with clean water. After decontamination, clothing should be removed and skin contamination washed away. If possible, decontamination should be completed before the casualty is taken for further medical treatment. An individual who has received a known nerve-agent exposure, or who exhibits definite signs or symptoms of nerve-agent exposure should immediately be given the antidotes atropine and pralidoxime (2-PAM), as well an injected sedative/antiepileptic such as diazepam. In several nations the nerve agent antidotes are issued for military personnel in the form of an autoinjector such as the United States military Mark I NAAK. Atropine blocks a subset of acetylcholine receptors known as muscarinic acetylcholine receptors (mAchRs), so that the buildup of acetylcholine produced by loss of the acetylcholinesterase function has a reduced effect on their target receptor. Pralidoxime (2-PAM) reactivates the acetylcholinesterase enzyme (AChE), thus reversing the effects of VX. VX and other organophosphates block AChE activity by binding to the active site of the enzyme. The phosphate group on VX is transferred from VX to AChE, which inactivates the enzyme and produces an inactive metabolite of VX. Pralidoxime removes this phosphate group. However, if pralidoxime is not given soon enough, the inactivated enzyme will “age”, resulting in a much stronger AChE-phosphate binding, that pralidoxime cannot reverse. Controlled studies in humans have shown that minimally toxic doses cause 70–75% depression of erythrocyte cholinesterase within several hours of exposure. The serum level of ethyl methylphosphonic acid (EMPA), a VX hydrolysis product, was measured to confirm exposure in one poisoning victim. The chemists Ranajit Ghosh La-a and J.F. Newman discovered the V-series nerve agents at the British firm ICI in 1952, patenting diethyl S-2-diethylaminoethyl phosphono- thioate (agent VG) in November 1952. Further commercial research on similar compounds ceased in 1955 when its lethality to humans was discovered. The U.S. went into production of large amounts of VX in 1961 at Newport Chemical Depot. The discovery occurred when the chemists were investigating a class of organophosphate compounds (organophosphate esters of substituted aminoethanethiols). Like Gerhard Schrader, an earlier investigator of organophosphates, Ghosh found that they were quite effective pesticides. In 1954, ICI put one of them on the market under the trade name Amiton. It was subsequently withdrawn, as it was too toxic for safe use. The toxicity did not go unnoticed, and samples of it had been sent to the British Armed Forces research facility at Porton Down for evaluation. After the evaluation was complete, several members of this class of compounds became a new group of nerve agents, the V agents. The best-known of these is probably VX, assigned the UK Rainbow Code Purple Possum, with the Russian V-Agent coming a close second (Amiton is largely forgotten as VG). This class of compounds is also sometimes known as Tammelin’s esters, after Lars-Erik Tammelin of the Swedish National Defence Research Institute. Tammelin was also conducting research on this class of compounds in 1952, but did not widely publicize his work. The name is a contraction of the words “venomous agent X”. There was evidence of a combination of chemical agents having been used by Iraq against the Kurds at Halabja in 1988 under Saddam Hussein. Hussein later testified to UNSCOM that Iraq had researched VX, but had failed to weaponize the agent due to production failure. After U.S. and allied forces had invaded Iraq, no VX agent or production facilities were found. However, UNSCOM laboratories detected traces of VX on warhead remnants. In December 1994 and January 1995, Masami Tsuchiya of Aum Shinrikyo synthesized 100 to 200 grams (3.5 to 7.1 oz) of VX which was used to attack three people. Two people were injured and one 28-year-old man died, who was the first victim of VX ever documented in the world at that time. The VX victim, whom Shoko Asahara had suspected as a spy, was attacked at 7:00 am on December 12, 1994 on the street in Osaka by Tomomitsu Niimi and another AUM member, who sprinkled the nerve agent on his neck. He chased them for about 100 yards (90 metres) before collapsing, dying 10 days later without ever coming out of a deep coma. Doctors in the hospital suspected at the time he had been poisoned with an organophosphate pesticide, but the cause of death was pinned down only after cult members arrested for the subway attack confessed to the killing. Metabolites of VX such as ethyl methylphosphonate, methylphosphonic acid and diisopropyl-2-(methylthio)ethylamine were later found in samples of the victim’s blood seven months after his murder. Unlike the cases for sarin gas (the Matsumoto incident and the attack on the Tokyo subway), VX was not used for mass murder. On February 13, 2017, Kim Jong-nam, half-brother of North Korean leader Kim Jong-un, died after an assault in Kuala Lumpur International Airport in Malaysia. According to the authorities he was murdered by poisoning with VX which was found on his face. The authorities further reported that one of the women suspected of applying the nerve agent experienced some physical symptoms of VX-poisoning. The director of a non-proliferation research program of the Middlebury Institute of International Studies at Monterey stated that VX fumes would have killed the suspected attackers even if they had been wearing gloves, suggesting that the VX was applied as two non-fatal components that would mix to form VX only on the victim’s face. Some countries known to possess VX are the United States, Russia, and Syria. A Sudanese pharmaceutical facility, the Al-Shifa pharmaceutical factory, was bombed by the U.S. in 1998 acting on information that it produced VX and that the origin of the agent was associated with both Iraq and Al Qaeda. The U.S. had obtained soil samples identified as containing O-ethyl hydrogen methylphosphonothioate (EMPTA), a chemical used in the production of VX which may also have commercial applications. Chemical weapons experts later suggested that the widely used Fonophos organophosphate insecticide could have been mistaken for EMPTA. In 1969, the U.S. government canceled its chemical weapons programs, banned the production of VX in the United States, and began the destruction of its stockpiles of agents by a variety of methods. Early disposal included the U.S. Army’s CHASE (Cut Holes And Sink ‘Em) program, in which old ships were filled with chemical weapons stockpiles and then scuttled. CHASE 8 was conducted on June 15, 1967, in which the steamship Cpl. Eric G. Gibson was filled with 7,380 VX rockets and scuttled in 2,200 m (7,200 ft) of water off the coast of Atlantic City, New Jersey. Incineration was used for VX stockpile destruction starting in 1990 with Johnston Atoll Chemical Agent Disposal System in the North Pacific with other incineration plants following at Deseret Chemical Depot, Pine Bluff Arsenal, Umatilla Chemical Depot and Anniston Army Depot with the last of the VX inventory destroyed on December 24, 2008. 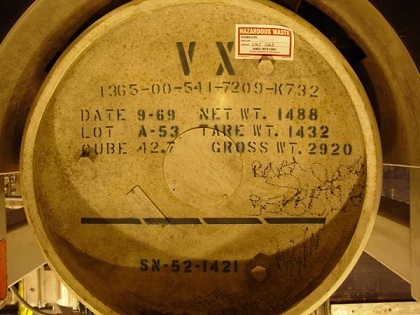 Worldwide, VX disposal has continued since 1997 under the mandate of the Chemical Weapons Convention. In fiscal year 2008, the U.S. Department of Defense released a study finding that the United States had dumped at least 112 tonnes (124 short tons) of VX into the Atlantic Ocean off the coasts of New York/New Jersey and Florida between 1969 and 1970. This material consisted of nearly 22,000 M55 rockets, 19 bulk containers holding 640 kg (1,400 lb) each, and one M23 chemical landmine. The Newport Chemical Depot began VX stockpile elimination using chemical neutralization in 2005. VX was hydrolyzed to much less toxic byproducts by using concentrated caustic solution, and the resulting waste was then shipped off-site for further processing. Technical and political issues regarding this secondary byproduct resulted in delays, but the depot completed their VX stockpile destruction in August 2008. The remaining VX stockpile in the U.S. will be treated by the Blue Grass Chemical Agent-Destruction Pilot Plant, part of the Program Executive Office, Assembled Chemical Weapons Alternatives program. The program was established as an alternative to the incineration process successfully used by the Army Chemical Materials Agency, which completed its stockpile destruction activities in March 2012. The Blue Grass Pilot Plant has been plagued by repeated cost over-runs and schedule slippages since its inception. In Russia, the U.S. is providing support for these destruction activities with the Nunn-Lugar Global Cooperation Initiative. The Initiative has been able to convert a former chemical weapons depot at Shchuchye, Kurgan Oblast, into a facility to destroy those chemical weapons. The new facility, which opened in May 2009, has been working on eliminating the nearly 5,400 tonnes (5,950 short tons) of nerve agents held at the former storage complex. However, this facility only holds about 14% of Russian chemical weapons, which are stored at seven sites. One of the best-known references to VX in popular culture is its use in the 1996 film The Rock, which centers on a threatened VX attack on San Francisco from the island of Alcatraz. The film uses artistic license, notably with VX being ascribed corrosive powers it does not possess, permitting an early scene in which a VX victim is shown with his face melting, rather than dying through asphyxiation. It also shows the hero applying an intracardiac injection of atropine as a defense against VX contamination, rather than the more usual intramuscular injection (e.g. into the thigh) of a combination of atropine and pralidoxime. In the BBC One spy drama Spooks, an episode named “I Spy Apocalypse” (Series 2, Episode 5) features an EERE (Extreme Emergency Response Exercise) turned real life emergency. A dirty bomb was reported to have exploded in Parliament Square and later the Morningside area of Edinburgh. The bomb was confirmed to have dispersed VX in quantities that exceeded the lethal dose across much of the southeast of England. It is later found that the emergency is a well constructed and believable exercise designed to test the MI5 officers to their limits. In the CBS American science-based drama television series Eleventh Hour, an episode named Subway (Episode 16); Dr Hood, a science advisor to the FBI is called in to determine the cause of a poison cluster, which is killing people in Philadelphia. VX agent was featured on the History Channel’s television series Modern Marvels in the episode Deadliest Weapons (Season 11, Episode 10).